This year at the Tokyo Game Show, Kotaku had the pleasure of sitting down with Mizuno Naoko, the creator of Hyperdimension Neptunia (and both of its sequels), to talk about the past, present, and future of the series. As we sat 47 floors above the game show proper, she told me about the origins of Neptunia. Late in the last decade, Mizuno made two observations which would form the core of Neptunia. "First and foremost, I realized there were no games on the market that actually dealt with or parodied the game industry itself. The second thing is that, at the time, characters that changed—that took on different forms—were really popular, but there were none that were cute girls." As these two observations mixed in her head, Neptunia was born. As the concept for the game came together, so did the main character: Neptune, based on the unproduced Sega console of the same name. To Mizuno, Neptune was the perfect character for her nostalgic parody of the game industry. Unlike in previous generations of gaming, Sega was no longer in the console business; but by casting Neptune as the lead character, she would be able to create a world where Sega was still fighting for the top. Since her inception, Neptune has been Mizuno's favorite character due to her being "energetic and bright to the point of idiocy." Even in the darkest situations, she still makes happy and positive comments. Of all the comedic moments across the three Neptunia titles, Mizuno's favorite is from the newest title Hyperdimension Neptunia Victory (scheduled for release in the West early next year). With a jumping mechanic added in this latest game, each character occasionally comments when performing the action. Mizuno loves Neptune's comment of "Like a kangaroo!" so much that she listens to the soundfile constantly—even at work. Despite—or perhaps because of—her love for Neptunia, Mizono has some regrets when she looks back at the series. She feels that when it comes to the writing, the game sometimes just runs away with itself and goes on a bit too long. She also wishes she could have better streamlined the interface and other systems and made the games easier to simply pick up and play. 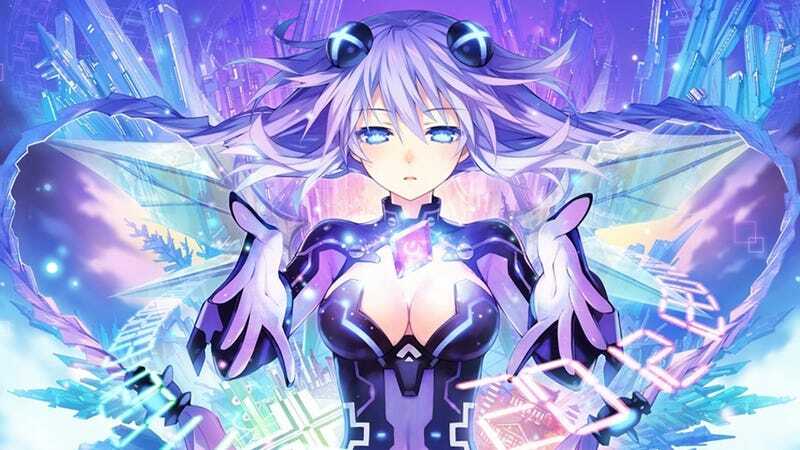 Mizuno stated that, ideally, she'd also want the Neptunia games to be fully voiced. However, because they have the ability to write and create new scenes at any time before the game is released, they often add new scenes long after voice recording has been completed—making a fully voiced game a practical impossibility. Given a hypothetically unlimited budget, Mizuno had a few Neptunia dream projects she'd like to make. "If I didn't take all the money myself," she joked, "I'd like to do something like a dating sim game—a love game—with the characters. Another idea would be a fighting game. Those would be really cool places to take the series." As for where Neptunia will go from here, Mizuno stated that there is a lot in planning as well as on the drawing board. She hopes to add more and varied worlds for Neptune to visit as the series continues, and she has no doubt players will be able to enjoy the parody-filled world and characters they love for years to come. So it's safe to say that even beyond Neptunia Victory, there is more Neptunia in our future. Hyperdimension Neptunia Victory was released on August 30, 2012, in Japan for the PlayStation 3. It will be released in the West in Spring 2013.